Home » Complete Guides » How to Build a Plant Propagation Bed for Rooting Cuttings. Building a Bed for Rooting Cuttings is really easy and it’s something that you shouldn’t over think. Many people ask about putting things like hardware cloth (screen) or Weed Barrier Fabric in the bottom of the bed to keep critters out and I always tell them not to. The roots of the cuttings will get tangled in the screen or fabric and make it difficult and damaging to the cuttings as you remove them from the bed. Tens of Thousands of Rooted Cuttings Waiting to be Potted. This is our propagation, rooting cutting area. The three beds that you see are completely full so I’m adding a new bed so we can stick thousands and thousands of cuttings this summer. Notice in this photo that as I added more beds I started sitting the beds right on top of the ground. That’s because with heavy rains I was getting dirt and mulch washing into my cutting beds. I wanted them in the ground for winter protection, but it’s just not necessary, they do just fine as they are. This is how simple it is to build a bed for rooting cuttings. Building a Plant Propagation Bed for Rooting Cuttings. Step 1. I bought treated, one inch by eight inch lumber. I think this bed is around 20 to 25 feet long. Step 2. I marked out the area by putting down a string to make sure the boards were straight and I could maintain the dimensions I wanted. Step 3. I sprayed the existing grass and weeds in and around the bed with a non selective herbicide. I use glyphosate which is generic Roundup. Yes, I said the word! Roundup. If you want to beat me up about that You Can Do So Here. I’ve actually created a post where people can and do beat me up about using Roundup or Roundup like products. The truth is, people in this industry use chemicals to control weeds. They have to. Step 4. Won’t the glyphosate harm the cuttings as they are rooting? No it won’t. Despite what you read on the internet glyphosate does not linger in the soil when applied properly and I go into detail about that in this post. Step 5. After 72 hours I drive 30″ metal pipes in the ground to support the boards. For pipes I use 1/2″ electrical conduit, about $3.00 at a big box store. I only stake the outside of the boards, I let the sand hold up the inside of the boards. After spraying I wait 72 hours to give the herbicide a chance to translocate throughout the weeds and grass plants that I am trying to eliminate. During that 72 hour time period it’s really important to not disturb the weeds or grass at all. If you start digging and chopping the herbicide will not have a chance to work and the weeds and grass will thrive despite your digging and chopping efforts. This plant propagation bed is exactly 44″ wide. Step 6. I make my beds exactly 44″ wide outside edge to outside edge. That way if I want to cover them with snow fence or something else for shade, most of those kinds of materials are 48″ wide. Also if I decide to cover them for the winter, A Mini Hoop House fits Nicely over a 44″ Wide Bed. Notice that in the bed to the right of this new frame, those cuttings are all rooted and thriving. That bed was built exactly the same way, the cuttings are in coarse sand, the bed was sprayed when I built it just as I am doing here. You should see those cuttings now! I took this photo in June, it’s now October. They are huge! At least 12″ tall, most of them. So much for sand not having enough nutrition to root cuttings. Step 7. I usually layout the boards and drive the stakes as I am putting the Coarse Sand into the bed, that way I can use the sand to support the boards as I go. See this post for Information About Coarse Sand. I buy the sand buy the ton from a gravel supply company. About $25 a ton I think is what I pay. When this bed was finished it had over two ton of sand it in. I haul the sand on my 3/4 ton pickup. I shovel it off the truck into a “real wheelbarrow” and wheel it into the bed. Installing Automatic Watering to a Plant Propagation Bed. Step 8. With all of the sand in place I install the end board. I leave off until the end so I can wheelbarrow inside of the bed. Then I lay out the 3/4″ PVC water line that will feed the flat head spray nozzles. The System that I Use is Fully Automatic which is extremely important. It waters the cuttings at precise times so they don’t wilt and die. A propagation bed full of rooted cuttings. And here we are four months later. The bed that I built in June is full of cuttings that are fully rooted. This photo was taken in mid October and this is exactly how these rooted cuttings will go through the winter. I don’t cover them, I just leave them as is and they do fine. Notice the bed to the left of this one. Those are rooted cuttings from last year that we have yet to get potted up. Between now and early spring we’ll get them out of that bed, prune the roots a little to make the roots fill out more and we will trim the tops aggressively. Believe it or not I have already take the hedge shears to the tops of those cuttings at least twice! Pruning is extremely important. More about that here. The sooner you prune your rooted cuttings the sooner you will have nice full plants. Really? You really have to think this through. Look around your house. Look at all of the things that you own. How much did they cost? How much money have they made you? Recently Pam and I had to replace the refrigerator. $2,300 and they told me to only expect it to last 10 years! Folks, you have to take this seriously! Every single day in Our Private Members Area I see brand new members selling cuttings that they have rooted. We have members that have sold tens of thousands of dollars worth of rooted cuttings and liners just inside of our members area. And I’m not talking about “one lucky member”. I’m talking about many members who have done that. I am not going to promise that you can do that, but I see new members all the time selling hundreds of dollars in the Buy/Sell Area. Not to mention what they make selling plants locally to people in their home towns. I am going to do a couple of related posts to accompany this one. Exactly what is coarse and where can I find it? How to actually go about taking and making cuttings. I’m sure you have a million questions. You can post them below, but what you should do is Take the Trial for Our Private Members Area. You’ll be dumbfounded by the amount of information that is shared there daily. In May 2016 I received an order of tower poplar and Okanese poplar rooted cuttings from a Canadian vendor. I now want to propagate and sell rooted cuttings in the spring of 2019. When should I plant the cuttings for these trees? Most likely the best way to do these is via hardwood cuttings, but they wouldn’t be rooted until mid summer 2019. You say to support your beds “drive 30″ metal pipes in the ground to support the boards”. Do you cut those pipes into a certain length or do you leave the pipe at 30″ and drive the entire pipe in the ground?? Also, do you suggest running the trunk line for your irrigation system below your bed or is it OK to run it on top? I was wondering if your irrigation trunk line is above ground that it would freeze during the winter. I use the entire 30″ of electrical conduit to support the boards. All pvc lines are on top of ground so they can be winterized in the fall. Hey Mike! I’m super excited and ready to start growing anything and everything. I dove right into your reading material and I’m trying to soak up as much as possible. I just got out of the military and with God’s help I’m trying to find ways to become more financially stable from home and live and love and raise my family. The American dream, right? I’ve got a makeshift propagation box I put together from scraps with your writings as guidance. Should I go to a local place and find one or two of the plants off your “easy sell” list and try to get some cuttings rooted and sell them right off? I’m looking for definitive instruction or maybe you’ve got a book you’d be more inclined to sell me as I know your knowledge and time are valuable. I don’t have the funds for the university or the inside sellers group. I recognize those resources as extremely valuable and well priced but I need to build to that. Thank you for your time. Yes, grab a couple of plants that you can get cuttings from, get them rooted, pot them up and sell them on facebook. They’ll sell. Get good photos the plants you buy so you can use those photos to sell your small plants. Hello, I’m from Florida, zone 9a. The trees that I would like to propagate don’t seem to have a dormant period, as they’re either tropical or semi tropical. When is it best to take cuttings for them? I am new to your web site and I’m very impressed. I have property in upstate New York and I have always wanted to start a small nursery and now I’m following thru. My land is loaded with many types of ferns. I am thinking about growing and selling ferns. I haven’t seen much said about growing ferns. Is there something I should know, is this a bad idea? There is a good market for ferns, but you really need to started with named varieties so you don’t get in trouble with tagging issues. See this; Are the cuttings that you have to stick “Rant Compliant”. MIKE , THANK YOU ,HIGHLY APPRECIATE YOUR APPROACH TO HELP NEW MEMBER. I HAVE FEW QUESTIONS. 1} . IS IT LEGAL BUSINESS TO USE YOUR BACK YARD ONLY FOR PROPAGATION OF CUTTING. 2} MAY I BE INTRODUCED TO LIKE MINDED MEMBERS IN VA, WHERE I CAN VISIT FOR INTERACT..
3] SUGGESTED CURVING BEDS OF BACK YARD TO BE INCORPORATED IN LANDSCAPE WHAT YOU HAVE TO SAY. 4] JUNIPER , FORSYTHIA I HAVE PLANTED LAST YEAR HAD GOOD RESULT TO MY LANDSCAPE..SUGGEST IDEAL SEASON SEASON ,FROM WHERE CUTTING CAN BE ACQUIRED . 1. That depends on where you live and what rules your neighborhood has. To the best of my knowledge, it’s legal to garden just about anywhere. But running a business is a different thing. 3. Great idea, you want it to be neat and organized. 4. Cuttings are available in the members area pretty much year round. Lots and lots this spring. 5. To many variables for me to answer that. If you have good soil the cost could be zero. I live in Kentucky and I am curious about how you manage the PVC water pipes, etc. during the cold winters there in Ohio. What measures do you employ to make sure that none of your pipes freeze and burst during the winter? Some of the lines I blow out, others I just have valves that I can open. But they all have to be winterized or they’ll break to pieces. Kinda depends. Normally I’d say don’t use it, the loam might hold too much moisture and rot the stems. If you are using, https://mikesbackyardnursery.com/mikes-plant-propagation-kit/, then by all means use coarse sand. Other methods work, but nothing works like the mist. I started a small raised bed with sand and a few cuttings as a trial. I was thrilled to see my babies growing, and devastated to see them die. I am so very glad I did not purchase a large stock to start with. Pocket gophers loved my plants. They were able to eat the roots off those little plants in no time. I live in a high mountain desert where the gophers have been a huge part of the ecosystem. They were here first, and have created gigantic systems of tunnels. (God’s tillers) I live in a rural area, and I have used traps, poisons and poison gas. I can kill a bunch of gophers, but they are replaced by the offspring and the gophers moving in from neighboring fields. They use the old tunnels and then dig to the new roots – which is their preferred diet. There is no way I will be able to kill them all and I hope I will be able to learn to live with them until the entire area is better populated and more people participate in gopher control. I have started building 12″ deep raised beds with metal screens fastened to the bottom boards. I am hoping that this will give the roots enough depth and protection from the gophers. I hope the extreme summer heat (over 100 degrees for 2- 3 months and below 10 degrees for 2-3 months, very alkaline, saline soil and water will not prevent everything from growing. Bindweed, sagebrush, wild mustard and tumbleweed are the wild plants growing in my area. Farmers have had good success with straw and hay. They make good use of Generic Roundup, and literally buy it buy the gallons, and mix one gallon with water to make 15 gallons. Maybe I will try selling dried tumbleweeds on eBay. The deep beds with screen should work just fine as will plants grown in containers. Thanks for all you contribute to the plant enthusiast community! So that I’m clear…once I take and prepare my clippings, I just put those cuttings right into the sand of your system? There is no cover to protect the cuttings as they root? I’m worried about the sun burning my baby cuttings, as well as critters (squirrels and cats) digging in them…. That is correct. If you are using the system, https://mikesbackyardnursery.com/mikes-plant-propagation-kit/, they root quickly and easily. Some shade does help. Either set up in a semi shaded area or create temporary shade over the rooting bed. Mine are pretty much in full sun in the heat of the day, but we often run a sprinkler as well. You don’t have to, I’ve rooted for years with just the mist. You’ll be amazed at how well it works. You’re welcome and good luck with your grape cuttings. What cuttings do best by planting in November ? I live in middle tennessee. Does the cuttings bed need to be in the sun? Can I use peat moss in the bedding soil mix? You can but I’d mix in compost as well or even good topsoil. I would like to do some hardwood cuttings this fall. Is there a way to do a few boxes of cuttings in my basement? Would they grow faster? Is there an advantage over outside? I live in WI zone 4. Inside really isn’t good, the plants need to stay dormant while they root. Inside they’ll break dormancy and fail, or struggle because of not enough light. Outside really is better. I’m really excited about getting started but I started some cuttings with play sand (I read it somewhere) Now I see I’m not doing it right. One question I have. 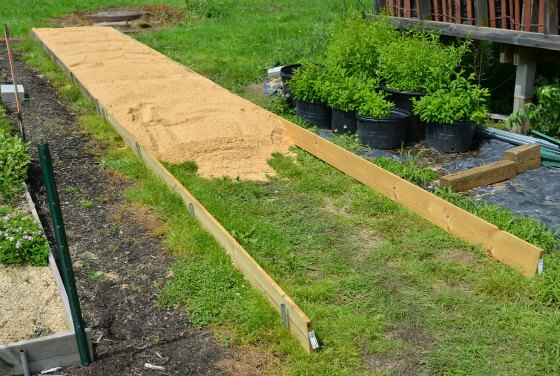 Can you use a nylon cover over the ground then put 8 inches of sand in your planting box? Would that be enough sand for rooting? Thanks for all your help….did I mention I’m really excited? 8″ of sand is plenty but don’t put anything under the bed. The roots will get tangled in it. Just clear a small space and go from there. Mike, I have been enjoying your emails and followers comments for about a year now. I love your pearls of wisdom. We bought a home in the woods on .61 acres which needed a lot of loving outside. Bushes and weeds and trees were all overgrown and filled with deadwood, a real fire hazard. Hundreds of large commercial lawn bags were filled with pine needles, small branches dead leaves and multiple trips to the dump were made. Our home is now beautiful and a little bit of heaven on earth. We have between 5-110 deer with their fawns that come by daily to visit. We love it here. I am a disabled veteran that enjoys gardening and hope to generate the necessary smile to develops my very own small nursery business someday. Thanks for your teachings. Bill Allen, Veradale, WA. Oh wow Bill. I pictured your home as nice as it could be. I love gardening, flowers and veggies. The more I plant the more i enjoy. I just received your book Easy Plant propagation and found the book to be very interesting. My goal is to start a miniature and dwarf fruit tree backyard farm. My niche would be the millions of people who lives in apartments and people who have small backyards. My questions to you is will your principal on propagation landscape plants work with dwarf fruit trees. Second were is a good source to find miniature or dwarf fruit trees or would starting from seeds would be my best bet. I live in Georgia, Zone 8. I want to root my Hosta, Hydrangea and Forsynthia, possibly do a propagation bed. My natural instinct or thought is that I do need to cover these cuttings through the winter months, as the Hosta will die back along with the others and pop their little heads in the spring. #1. Do I need to cover them? #2 would it be best to pot them in the Spring when they are coming back and just beginning to show>? I am excited about this new venture in becoming a “Back Yard” nursery. Covering is a bit of an option. Here in the north cover, but I’m in very cold, northern Ohio and I do not cover my rooted cuttings and they do just fine. Yes, pot them early in the spring before they leaf out. 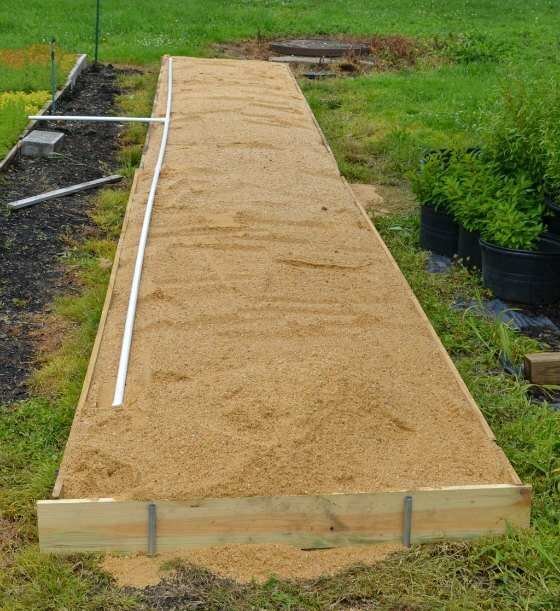 Can you explain why you are putting only sand in your propagation beds? In one of your other videos I watched you said that we need to add bark mulch and compost. There is a possible downside to using peat moss or other organic material in the sand to root cuttings, especially in the summer. I just bought your Backyard Cash Machine book last week. How does this propagation bed differ from the one you described there with the door as a cover? My husband and I are ready to build a propagation bed. Which should we make? We are in zone 5, if that makes a difference. Thanks for your wisdom and inspiration! The propagation bed in this post is for using this system, https://mikesbackyardnursery.com/mikes-plant-propagation-kit/ which works incredibly well. Propagation boxes work, but nothing is more predictable than the system that I and most of our members, http://backyardgrowers.com/join use. They swear by the system that I use. A propagation box has to be covered and shaded. I am very excited about the program. We live in Southwest Wisconsin.I love flowers and plants. It’s time to divide what I have. I can’t bear the thought of throwing all those potential plants. I have lots of lilies. I would love to get into growing shrubs.Any thing you can tell me is appreciated. Thanks for all the videos. I’ve gained a wealth of info already. I live in deep southest Texas east of Houston and it gets to 90-95 degrees in the shade. Can these root cuttings survive in that kind of heat? I have a greenhouse but it gets to hot in the summer to grow anything. Everything gets fried in the heat. Of course your weather is different than mine but years ago we had a grower in Alaska that had a successful backyard nursery. The techniques work anywhere in the world, timing and plants that you grow do differ. I wanted to ask can I use river sand in my propogation beds , I have that access, and it is off the mtn. You can but it would best if what you have is washed and screen. Most importantly, it has to drain well. I received my system but there was no video in the box. also, Are there extra sprinklers available to purchase? and finally, I want to grow mainly Boxwoods. Do they propagate well in this system. Waiting for April to join the group, but getting ready for a fun year ahead with an early spring.. Even quarries around here don’t have the silica sand mix nor silica sand in their catalogs, and it’s not to be found on line in the United States, I suspect, only grades of unidentified mineral, probably limestone which will allegedly acidify anything it’s mixed with. The closest thing I’ve found is expensive pea gravel. I need a hill of the mix. Where do you get it or its components? Also, I have iron water from a well, so will iron water ruin the sprayers or contaminate the sand? Because sand is so heavy, you have to find a local supplier and it varies. See this page https://mikesbackyardnursery.com/2015/10/exactly-what-is-and-where-do-i-find-coarse-sand-for-rooting-cuttings/ The iron is going to have an affect on the nozzles but vinegar should clean them up as needed. Hi try concrete ready mix suppliers they usually sell different grades of sand. There is a type of sand that is used on golf courses to fill sand traps which is prewashed and usually works well to root cuttings. You can buy an inexpensive PH meter on ebay (the electronic kind which measures the PH of liquids for less than $20. If you take a sample of the sand that you want to use in a drinking cup , add about 2 inches of sand and 4 inches total of water and wait 24 hours then use meter to measure PH you can find out if sand is chemically compatible with rooting cuttings . Thank you for the info. I am a happy University member. Waiting for April when I can join the Members Area. How much sun do your propagation bed receive? The amount of sun on your propagation beds using this system, https://mikesbackyardnursery.com/mikes-plant-propagation-kit/, depends on where you live. In a northern state like Ohio they really can be in full sun or almost full sun. But I still think at least partial shade is an advantage. In a place like Alabama or Texas, you’ll want to create some shade which is pretty easy to do. I have a few quick and to the point questions about your system. 1) is there a reason the planting beds are raised and not dug out. 2) how long does it take until the cutting are dug and potted with your system. Is there a video of your process of digging and potting rooted cuttings. 3) what do you do with your potted plants over winter. The beds are raised and not dug out for a couple of reasons. Digging is really hardwood, but more importantly than that, drainage is essential. If you are lucky enough to have really well drained soil, most don’t, you could put them in the ground. My soil drains really, really well and I used to dig out my beds just to protect the cuttings a bit more over winter. But in heavy rains I had dirt and mud washing into my propagation beds. So even though they drained well, all of the mud wasn’t helping me. Now all of my propagation beds are raised with one by eight treated wood. The time before digging and potting varies. Softwood cuttngs that are stuck in June can probably be potted in August, but I don’t like to pot when it’s really hot so I’d wait until mid September unless I had a shady place to put them after potting. Hardwood cuttings stuck in the winter really are not rooted well enough to transplant until mid summer, so the answer is really the same. Then you have to be careful getting them out of the bed. If you can do so without damaging roots you can pot them during the growing season. But if the root into the soil below the sand, you really need to wait until they are dormant to pot them. That’s why deeper sand is better. A video of getting cuttings out of the sand? Not that I can think of. I have thousands of cuttings to pull this spring, I hope we remember to shoot some video then. I guess I should have asked if it were as simple as popping up the cuttings or is there any special process you use to dig the delicate roots, Do you take just the plant and roots or do you leave sand around the roots when potting. Also, do you re-use the sand year after year. Getting the cuttings out of the sand is easy. I start in one corner of the bed and use my hand to dig under the cuttings then just lift a small group of cuttings out if the sand, the amount that would fit into the palm of my hand. Being that the sand is coarse it just falls away from the roots. I immediately wet the cuttings and the roots and over them with wet burlap and put them in the shade as we pot them. Keeping them damp and shaded right up until the time they go into the pot. I use the sand over and over for a few years until it starts to get too weedy. Then I might skim a few inches off the top and add fresh. As I mentioned they come out of the sand easily unless they are in there too long and root into the soil below. I have that situation going on now because I just ran out of room and time, mostly room to put more potted plants. So now I know that I have to get all of those cuttings out of the sand before the third week of April when they make leaves because I’ll have to use a spade to cut the roots at the soil level in order to get the cuttings out of the bed. That is traumatic on the plants and can only be done when they are dormant. Our members area will be open to new members April 1st I think, when it opens up I highly suggest you take the test drive. It will be the best $7.00 you’ve ever invested. http://backyardgrowers.com/join You won’t believe the amount of information that gets shared there daily, if not hourly. Questions are often answered in just minutes. To remove cuttings from sand without damaging roots use a heavy duty spatula or trowel like object . You dig down deeply under the cuttings then lift up which will pop out the cutings without damaging roots . A sure way to damage cuttings is to pull them out by the stem instead of lifting them from below. I have a heavy duty (almost unbendable stainless steel spatula from the Doller store and a margin trowel (less dollar ). and If you are working in limited space like a bucket you can use a stiff heavy dinner fork from Lowes which all work well. I agree with Alex, I often just work my fingers under the roots of the cuttings as he is doing with the spatula, lift gently shaking the sand off as I come up. In a bucket I usually just tip the bucket on it’s side and slide the whole lot of them out a once then gently work them apart once out of the bucket. I’m a new university member but have been watching you for a while now. I am a degeed horticulturist who teaches horticulture to felons. I’ve been doing this for 4 years and find it quite rewarding. Much of your information is not new to me but the business end is of particular interet both personally and professionally. You said you use 30″ conduit to support the 8 inch board. How far apart do you space the conduit? Is the sand so heavy that you need to put 22″ into the ground? With all the rocks we have that could be a problem. I have pretty soft soil so I need that 22″ in the ground. I’d say they are spaced about 50″ apart. Great post! Definitely going to put one of these in the yard (if it goes well maybe more than one). I know your site is geared a lot toward entrepreneurial gardening but do you have any posts about small scale vegetable gardening, like a personal sized garden that can sustain two people? 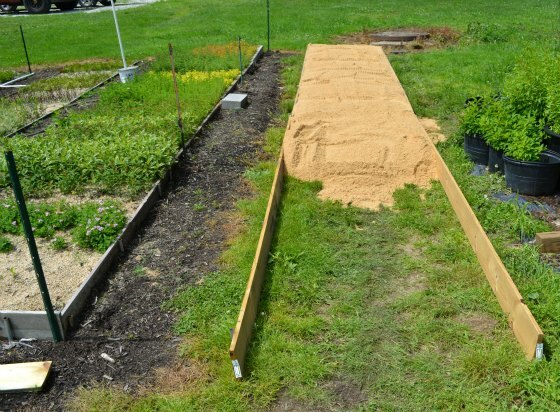 Ive been struggling to find simple plans like this one, but for a vegetable bed. Only you can decide whether or not it’s worth it for you. You won’t be able to buy, sell or even exchange plants with other members because of plant shipping restrictions. The information is good, but whether or not you can justify the investment just for information is something that only you can decide. In regards to using vinegar as a weed killer, one needs to be cautious with it as well. It IS an acid and if breathed can be a concern. I asked a Horticulturist about using vinegar instead of glyphosate and that is the reply he gave me. So as Mike said, we need to be careful with many things while gardening. ”Hi Mike I have a question, this February I am going to be taking hardwood blueberry cuttings and I was wondering if your plant propagation box with the lid on top will work for blueberries. I am taking about 300 cuttings Duke, Blueberop and Reka variety. We live in Canada British Columbia and it is on the coast. Here in B.C. we have a huge blueberry industry and I was just wondering if I will need to install a 1/4 inch grid mesh 6 inches above ground level to keep the media warm. Is this necessary for blueberries? ‘Thanks! I saw a video where a guy made some cuttings and all were about 8 to 10 inches long. He place them in a big clear plastic juice jugs and added an in ch of water. He said that in a week to two weeks the curring will start getting little white hairs for rooting and after a month he put them in a compost port to get better roots. Thank you for admitting you use that cancer causing pollutant glyphosate. It poisons the water table. I would advise you learn even more about your passion from permaculture people. Good luck. Why don’t you use vinegar. There glyphosate in mothers milk – it’s in everything! let’s stop the Monsanto marketing speak ie lies once and for all? http://www.biconet.com/lawn/burnout.html St Gabriels offers a commercial product that works really well and is safe for kids and pets. I just read a report about ‘zombie weeds’ – weeds that have evolved to become resistant to Round Up causing new headaches. Not to mention the concerns about cancer. Why take a chance? We take a chance with everything we do, everything we touch. I’ve yet to experience a zombie weed as has been reported and I don’t know of anybody that has experienced zombie weeds and I’ve been working in this industry for over 40 years. And who says the product you mention is safe? The manufacture. If it’s a new product, do we really know. At the end of the day each of us have to decide what’s best for us. We do so many other things that are completey unsafe and unwise as a population, but those things never get blown out of proportion. I signed up many years ago. Am I still a member in this elit club? I get your emails. The private members area, http://backyardgrowers.com/join, is a paid membership and you would have a username and password if you were a current member. The test drive is only $7, a permanent memberships is more because of the value of membership. It’s not for everybody, only for those that are truly committed to being successful at growing and selling small plants. 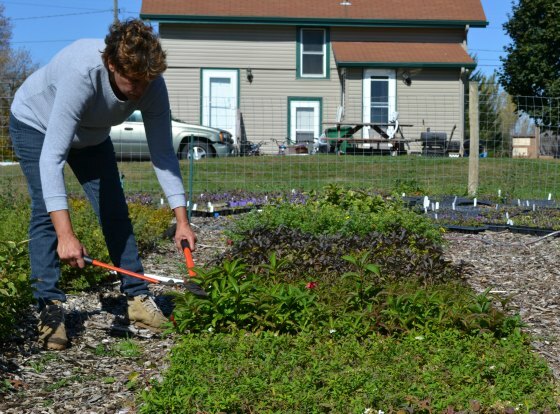 In making your propagation bed, you indicate that you use 30″ electrical conduit. Looking at the end cap of your bed, it appears that only eight inches is above ground. You don’t really pound 22″ into the ground do you? Also, wouldn’t potting mix work as well as sand for the rooting medium? I do pound 22″ into the ground. My soil is very sandy and not all that stable. I have to go that deep in order make the stakes stable. Potting mix is likely to hold too much water when using the automated method, https://mikesbackyardnursery.com/mikes-plant-propagation-kit/ which works incredibly well for softwood cuttings. Without the automation this method won’t work well because the cuttings will burn up in a matter of hours. The system waters them on a regular basis therefore the rooting medium has to drain really well. I was wondering what cuttings I could start this fall being October now. I live in Northern illinois. I see that when you make your beds you are driving pipe down along the lumber to keep it upright. I used to do that also but changed to another method. I set the boards up and then drill a 3/8 inch hole down through the board. I then take 3/8 inch rebar and pound them into the holes. ( I get 36 x 3/8 inch fence electric fence posts from Tractor Supply and cut them in half. ) I found this works quite well and I don’t tear up my mower blades as I mow along the beds. i tried rooting the trimmings from my Bonsai this year, and it worked! i am excited about doing hardwood cuttings this winter. i did grapes, and they worked too! thanks Mike. This is why Mike’s group is worth every Penny, nickel, and dime to belong too! Mike has shown you how to get started with your own Nursery business and then build on the information Mike gives us! Make friends with some local Landscapers and find out what they like to purchase, and start propagating. Then it is time to get a State Nursery license and make some spare money, how much depends on you. I appreciate your support, you know as well as I that you have to experience the private members are to truly appreciate what takes place there everyday.